Chlorinated Paraffin Market size was estimated over USD 1.6 billion in 2016 and the industry will grow by a CAGR more than 3% up to 2024. Chlorinated paraffin market will witness growth as an additive material to produce various metal working fluids and plastic products. Growth in manufacturing sector will drive the market demand as several companies are engaged in manufacturing of equipment & machineries, automobiles, metal products, etc., especially in the Asia Pacific region. For an instance, in 2016, Indian manufacturing sector contributed over USD 310 billion to GDP and foreign direct investment (FDI) reached over USD 70 billion in 2017 with major multinational companies being attracted to the high availability of cost efficient human resource in the country. Increasing demand for automobiles, building & construction materials, rubber & plastic products, etc. will positively influence the manufacturing domain growth in coming years due to the upsurge in purchasing power coupled with changing consumer lifestyle. The product is excessively used in the formulation of metal cutting fluids, added in PVC to produce numerous products and also used as plasticizer in rubber and plastic products in order to impart the flexibility and flame-retardant quality. This in turn, will support the market penetration in the near future. Increasing usage of flame retardants in myriad end-user domains such as paints & coatings, electronics & appliances, building & construction, etc. will propel the industry growth by 2024. This is all due to the implementation of regulations such as NFPA 255, NFPA 220, NFPA 703, CFPA, etc. regarding the fire safety in countries including the U.S., Germany, Singapore, Australia and Japan. These factors will significantly enhance the market demand from 2017 to 2024. Positive trend towards the acceptance of bio-based products, green environmental image and volatility in raw material prices are the crucial reasons for restraining the market growth in future. Internal substitution, such as declining the usage of short chain grade and replacing with medium one in several end-user industries due to the potential prohibition in developed regions, may also hinder the industry growth in coming years. Medium-chain (M-chain) grade accounted for more than half of the total market share in 2016 and will grow at a significant rate in coming years. The grade is primarily used as a plasticizer in the synthetic rubber processing sector due to its good stability, full compatibility, non-flammability, and other features. The carbon chain length of M-chain grade is usually between 14 – 17 carbon atoms with 40 – 70% chlorine content. Resistance against extrusion, low volatility, excellent chemical stability, non-toxic and moisture proof are key characteristics of the product and makes it ideal as a lubricant and metal working fluid additive in the manufacturing sector. The M grade is cost effective which enhances its application in myriad end-user domains such as adhesives, sealants, commercial paints, etc. and will strengthen the chlorinated paraffin market penetration in forecast period. Long-chain grade held a prominent market share in past couple of years and significant revenue generation can be attributed to extensive usage of the product in many end-user domains such as in paints & coatings, manufacturing, leather, rubber, etc. as a flame retardant, plasticizer, lubricating additive, etc. These provides various technical benefits and will augment the market demand over the forecast time frame. Metal working fluids dominated the overall chlorinated paraffin market with over 30% revenue share in 2016 and is likely to grow at a substantial rate by 2024. Extensive usage of the product in several manufacturing sectors such as automotive, aerospace, etc. due to its extreme flame retardant properties, compatibility with oils and other features. Growth in manufacturing sector will propel the segment demand in the market over the forecast period. Plastics additive is the fastest growing application domain and is likely to expand with CAGR close to 3.5% by 2024. High consumption of the product for the production of PVC products, plastics and other industrial products owing to its outstanding fire resistance, flexibility, conditioning and other mechanical features. This will boost the market demand in future. Considering end-user segments, the market is segregated as manufacturing, rubber, paints & coatings, leather and textile industries. Other minor end-user segment comprises adhesives & sealants, plastics, etc. Manufacturing and rubber industries, collectively will grow at a significant CAGR more than 3% in the forecast spell due to the increasing usage of rubber and flame retardants products in automobiles, buildings, packaging, etc. This in turn, will propel the chlorinated paraffin market growth by 2024. Growth in the rubber industry is attributed to the product features such as compatibility with oils, flame retardancy, water & chemical resistance, and viscous nature, which makes it perfect to produce the rubber products such as cable, toys, conveyer belts, carpet backing, etc. and will fuel the segment growth over forecast period. 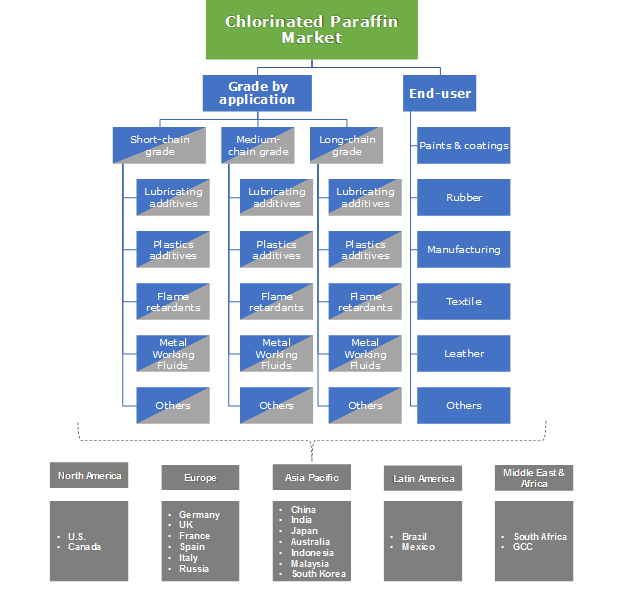 Asia Pacific chlorinated paraffin market will be expanding at a CAGR over 3.5% by 2024. Growth of textile and manufacturing sectors driven by substantial rise in personal income level coupled with improved monetary condition is the key factor supporting the market growth in forecast spell. Continuous production of all grades of chlorinated paraffin in China and India is likely to expand and will significantly impact the product demand in these regions. North America is likely to lose its market share in forecast period due to the stringent regulations regarding the usage of short chain grade in the U.S. Increased emphasis on green products and rising demand for bio based products will also restrict the market growth in this region. Europe and Latin America will also show the sluggish growth in the market over the forecast time years owing to the economic slowdowns in the regions. Dover Chemical, INOVYN, INEOS Chlor, United Group, Aditya Birla Chemicals, Ajinomoto Fine-Techno, JSC Kaustik, LEUNA-Tenside GmbH, Altair Chimica SpA, Caffaro Industrie, Handy Chemical Corporation Ltd, Quimica del Cinca, S.A., and Makwell Group are the prominent players in the chlorinated paraffin market. Dover Chemical held a significant share in the market and also engages in the formulation of biodegradable chlorinated paraffins in order to keep the green image across the North America. Hence, the company has a significant competitive edge in the market. 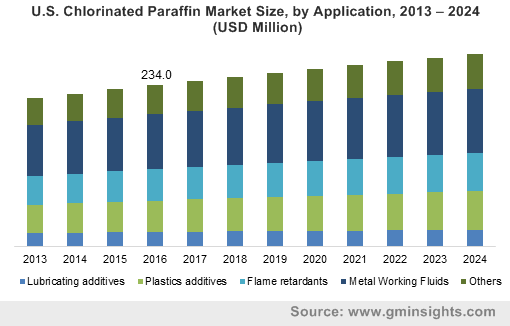 Increasing demand across various end-user industries coupled with product development will likely to fuel the chlorinated paraffin industry growth at the of forecast period. Extensive usage of the product as flame retardants, lubricating & plastics additives, metal working fluids additives in manufacturing, paints & coatings, textiles, rubbers and other industries will influence the industry in coming years. Additionally, production expansion in Asia Pacific region is likely to boost the market growth.